DMAIC is an excellent end-to-end process to give structure to your whole problem solving endeavour. 5 Whys is a flexible technique for probing root causes. Ishikawa is a terrific approach to information gathering and helps ensure comprehensive coverage of the problem area. The Ishikawa diagram (and most of the other techniques I discussed) is a top-down approach. 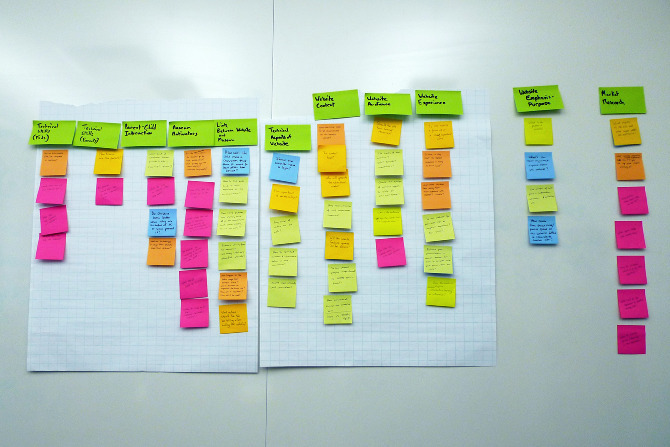 The distinctive element of the Affinity diagram is that it is created bottom-up. Whilst the Ishikawa (and Mind Map) are drawn by starting with general topics (or questions) and then drilling down into detail, the process of drawing an Affinity diagram begins with a brainstormed set of detailed observations and facts. The bottom-up idea can sound unstructured, but is it ever a bad thing to have too many ideas? Probably not, but if you've ever experienced information overload or struggled to know where to begin with a wealth of data you've been given, you may have wondered how you can use all of these ideas effectively. When there's lots of "stuff" coming at you, it is hard to sort through everything and organise the information in a way that makes sense and helps you make decisions. Whether you're brainstorming ideas, trying to solve a problem or analysing a situation, when you are dealing with lots of information from a variety of sources, you can end up spending a huge amount of time trying to assimilate all the little bits and pieces. Rather than letting the disjointed information get the better of you, you can use an Affinity diagram to help you organise it. 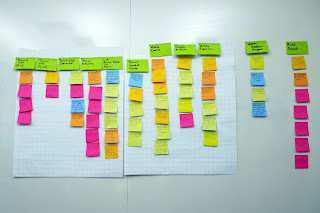 Also called the KJ method, after its developer Kawakita Jiro (a Japanese anthropologist) an Affinity diagram helps to organise large amounts of data by finding relationships between ideas. The information is then gradually structured from the bottom up into meaningful groups. From there you can clearly "see" what you have, and then begin your analysis or come to a decision. You’re now in a similar position to where you would be with an Ishikawa diagram and can proceed accordingly. The benefit of the Affinity diagram over Ishikawa is that the bottom-up approach can produce different results and thereby offer different perspectives on your problem. Affinity diagrams are great tools for assimilating and understanding large amounts of information. When you work through the process of creating relationships and working backward from detailed information to broad themes, you get an insight you would not otherwise find. The next time you are confronting a large amount of information or number of ideas and you feel overwhelmed at first glance, use the Affinity diagram approach to discover all the hidden linkages. When you cannot see the forest for the trees, an Affinity diagram may be exactly what you need to get back in focus. If you'd like to know more about some of the other techniques, you can catch an audiovisual recording of my whole paper on Brainshark.